PLEASE NOTE: LEMON TREEE HOUSE IS NOT 3KM FROM POROS CENTRE AS STATED ABOVE. IT IS ABOUT 100M!! HomeAway cannot apparently change this. 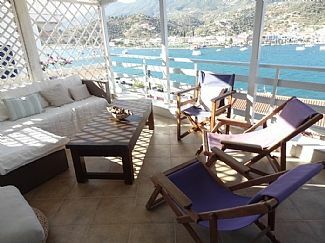 'In Poros Town, Lemon Tree House overlooks the harbour and enjoys unrivalled panoramic sea and mountain views. Just one hour from the port of Athens, Poros offers unspoilt island magic and, whilst here, the holidaymaker has an opportunity to visit the surrounding Saronic islands of Aegina, Hydra, Spetses and beyond. Lemon Tree House has been extensively refurbished and is offered in fine style and comfort retaining the pastel shades of Poros. The accommodation is spacious and much thought and design has been put into creating a very special home. The two terraces and surrounding pretty gardens with exotic plants and white painted steps create a truly relaxing spot. Relaxing on the terrace in the evening, the sea views and the twinkling lights of Galatas reflected in the water are quite hypnotic and it would be impossible to not enjoy this island which is yet to be fully discovered and remains a favourite of the Athenians.' Once experienced, never forgotten! I have been involved with property for as long as I can remember and when we first visited Begur in we thought it a wonderful region and decided to buy a holiday home, Casa Alfora. We rented it out through a local agent the first year (2001). After that I decided to rent it out myself and since then we have built two more houses and purchased another in Begur all of which are on this site. Gradually I built up a business and we now have our own website featuring property in Spain, Italy, Greece and Portugal. Poros Island, Greece is a favourite destination of ours where we have a house overlooking the harbour and on the mainland, both with amazing views and both of which are featured on this website. Now we have added our lovely Padstow cottage to this site. We hope you like it! Lemon Tree House is simply one of the best places! The weather is so dependable in the summer months and sitting on the terrace is better than the best TV programme or film. It is so soporific that we nearly always end up falling asleep in the deckchairs at the end of the evening, transfixed by the shimmering water reflecting the lights of Galatas. We bought Lemon Tree House after visiting Poros for many years and we try to have a sailing trip around the islands every year as well as spending time in the house. It is so easy to get to Poros, being just 1 hour from the port of Athens, and this is a big plus. We usually get the early morning flight and can be at Poros harbour by 3pm. No car is necessary and when we are there with friends and family it is easy to be independent. Top floor: Bathroom with bath and shower, basin, wc and bidet. Ground floor: Bathroom with 2 basins, bath, shower, wc. Canali beach is the nearest; approx 15 mins walk or take the bus or taxi from the harbour. All facilities along the pretty harbour such as tavernas, cafes, bars, shops, bank, supermarkets. A family friendly resort great for all ages. Not a party island. Lots of opportunity for enjoyment. Amazing panoramic views of the sea from the terraces, living room and the bedrooms. Top floor: Spacious living-dining room seating and dining area. French doors to a full width terrace with comfortable seating and dining table. Sofabed and/or folding bed available. Internet and SAT TV. Ground floor: Living room - 2 sofabeds. Top floor: fridge-freezer, washing machine, oven, hob, kettle, toaster, coffee maker, etc. Newly refurbished and attractively decorated with marble worktops. Ground floor: Secondary kitchen with hob, fridge, kettle, toaster, worktops and cupboards. Notes on accommodation: Lemon Tree House can be rented as separate apartments, sleeping up to 4 in the upper apartment and up to 6 in the lower apartment. Please ask for rates. The nearby harbour offers an array of interest for young children, teenagers and adults alike. There are many beaches within easy reach and the small boats from the harbour can take you in 2 minutes across the water to the mainland at Galatas where you might want to hire a car and explore the mainland. There are several swimming pools nearby where no charge is made and provision of sunbeds and a snack bar or taverna is always close at hand. Two buses tour the island every hour and stop off at all the beaches making a very convenient mode of travel. The house is suitable for children but toddlers would need to be watched at all times as there are open stairs between the 2 levels. Travel light- access by foot from the harbour- 5mins up, 1 min down! Outside: Pretty gardens surround the house with exotic trees and a lemon tree and shrubs. The lower apartment has an enclosed terrace with table, chairs and parasol. Panoramic views can be enjoyed here as well as on the upper terrace which is really the best spot of the house with comfortable seating and dining table and chairs. Easy access from the living area and the bedroom. There is free use of several swimming pools with sunbeds and restaurants a short distance from Lemon Tree House by bus, taxi or water taxi. At Askeli beach there are many water sports available. Bicycles can be hired for about 5 euros per day and also scooter and car hire is available, although it is very easy to get around without hiring a car. Each apartment can be accessed separately and rented individually or as a whole house. Please ask for rates for individual apartments. Cleaning / Towels / Linen / Maid service: Linen and towels are included and changed weekly. Lemon Tree House can be rented as separate apartments, sleeping up to 4 in the upper apartment and up to 6 in the lower apartment. Please ask for rates. All rooms enjoy sea views and are beautifully decorated and presented. Aircon in 3 bedrooms and living area plus ceiling fan in living room. It has lovely views down to the harbor and a large, comfortable terrace to relax on , plenty of space , and the facilities well looked after by two very helpful ladies. It is really well situated for restaurants close by and boats to other islands should you wish to explore. We made good use of all the beaches and fab snorkeling opportunities. So relaxed ....just what we needed . Looking forward to another stay and will definitely be recommending to others. Great place to stay in the heart of the community. Fantastic views. Well equipped. All amenities close by yet peaceful and relaxing. You will never tire of the view to the harbour. Very highly recommended. Lemon tree house is in a stunning location overlooking the sea with wonderful views that can be appreciated from a very lage balcony stretching across the front of the house. The house is very comfortable and well equipped and brilliant for large groups or families. It is very easy to walk down into the town and get around to all the lovely beaches on the island or take the ferry across to the mainland. We thoroughly enjoyed our trip and will definitely be back! Thanks very much for your positive review and we really hope you'll come back to Lemon Tree House!!! Upon arriving we quickly slipped into life on the island. Morning coffee looking out at the activities on the channel at sunrise, or sipping an unpretentious wine at sunset, created the perfect atmosphere to explore Poros. It was the perfect base from which we ventured to Delphi, the Acropolis and Hydra. Tracey and Jan our house managers exceeded our expectations and helped make our holiday easy living. From the harbour you can hop on one of the many taxi boats to visit the mainland or a 10-15 minute stroll takes you to the nearest sandy bay at Canali beach. A bus service every hour tours the island, stopping at the many beaches or a taxi is always available at a cost of about 5€. Ferries travel to the surrounding Saronic islands of Aegina, Hydra, Spetses or you can return to Pireaus and visit many other islands. Water Sports- skiing, paragliding, canoing, etc. Fly to Athens. Take the coach or taxi to the port at Piraeus (approx. half an hour) From there the frequent Flying Dolphin service by hydrofoil will take you to Poros (1 hour). Alternatively you can take the ferry (2hrs 40mins). Another option is to hire a car or take a taxi from the airport to the mainland at Galatas, opposite Poros, and then take the ferry with your car across to Poros or a taxi boat to the island (5 mins). The harbour is 1min from the house with many amenities including tavernas, banks, daily food market, shops. From the harbour you can take a ferry boat to the nearby Saronic islands such as Spetses, Hydra and Aegina. The mainland is 2 mins across the water and you can explore many places of historic interest both on Poros and the mainland. Athens port is one hour by fast ferry and it is feasable to spend a day sightseeing in Athens. There are many activities on Poros including: water sports - skiing, canoeing, dinghy sailing, yacht chartering, paragliding, banana boat, jetski. The harbour is full of interesting shops and there is an abundance of small supermarkets, banks and bakeries selling freshly baked bread. A covered daily market selling meat fish and poultry is open till 1pm and there are many open stalls selling fresh fruit and vegetables. The choice of restaurants is very good, all family owned and offering very friendly service. The local wine is organic and very well priced. Many cafes along the harbour have comfortable seating and a late night drink here can be enjoyed amongst the convivial atmosphere of the island. There are many archaelogical places of interest to visit. The mainland at Galatas is under two minutes by taxi boat opposite Poros and you can hire a car or scooter to explore the mainland and the island. The beaches are all sandy and many have at least one taverna. Sunbeds and parasols are usually available for hire. If you prefer a swimming pool there are two available at no charge with sunbeds and parasols. Included in your rental: bed linen bathroom towels weekly cleaning weekly change of linen and towels soap kitchen cleaning items Booking Notes: A deposit of 30% is required at point of reservation. Balance payable 2 months prior to holiday. Payments taken in £s, Euros, debit/credit card/bank transfer. Optional Extras: Beach towels- £5.00 per person Extra cleaning- payable locally Shopping delivered to the house prior to arrival 20€ service charge. Check in time from 4pm or earlier by arrangement Checkout time by 10am or later by arrangement English agent meets you on arrival at the harbour and takes you to Lemon Tree House Changeover Day: Changeover day is flexible. Minimum booking is one week in the main season with shorter breaks available in low mid season periods. Small group rates available - please enquire Please ask if you have special requirements.